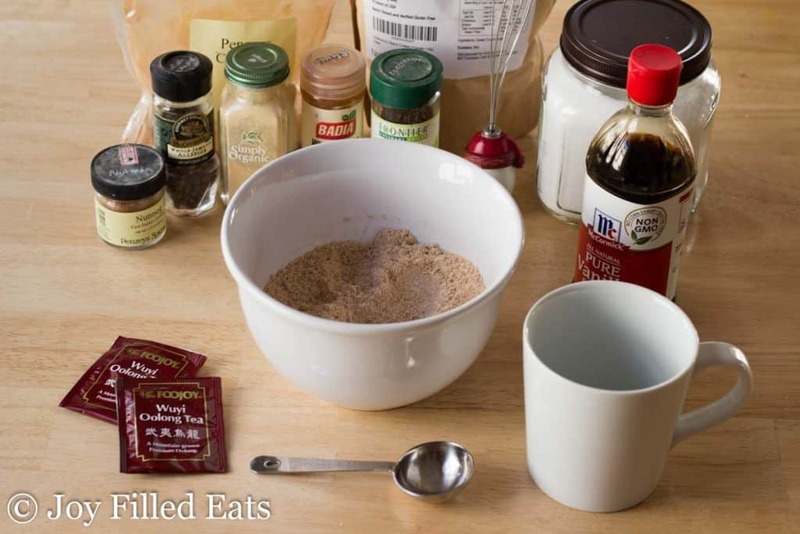 Just mix this Easy Chai Tea Mix into a cup of brewed tea for an instant sweet, spicy, creamy chai! I love sweet, creamy, hot chai tea on a cold day. 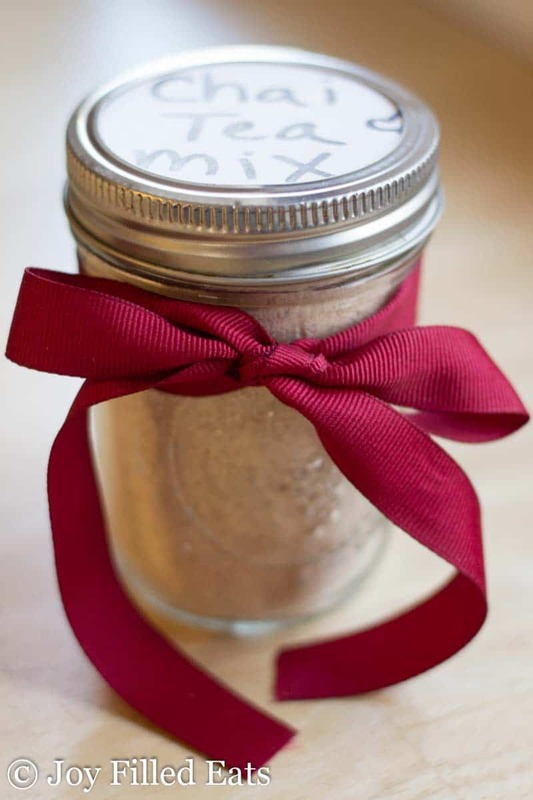 One year I even made instant chai tea mix and gave it as a gift to friends and relatives. It had powdered milk, powdered creamer, sugar, instant tea powder, and all the chai spices. I decided to give that recipe a makeover this week. The secret ingredient in this is Heavy Cream Powder. That is how you can get it creamy without using those other powdered products. This has 0 carbs making it great for low carb and a Trim Healthy Mama S.
I decided not to use instant tea mix in this recipe. It really isn’t much harder to steep a couple of bags of tea. The benefits of doing it this way are: you can choose your favorite variety of black tea, it’s cheaper, and it’s less processed. I made this with Oolong tea bags and it was amazing. These measurements will make 4-5 cups of chai tea. You can make this in larger quantities if desired. *** Some of these are pricey and I don’t use them very often. My recommendation is to buy whole spices and then grind them as needed. They can last years that way. To serve: Pour 12 oz boiling water over 2 tea bags. Let steep until the desired strength is obtained. 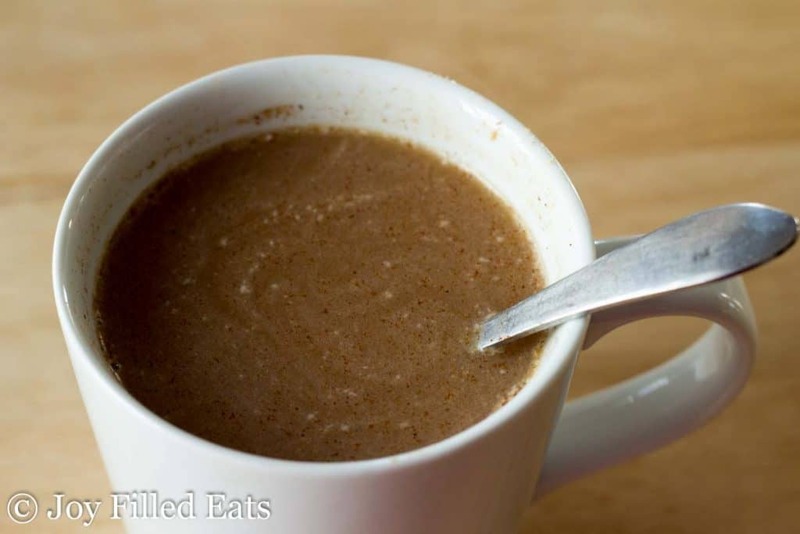 Stir in 3-4 tbsp instant chai tea mix. Add a few drops of vanilla if desired. Sip and smile. To make this a fuel pull just leave out the heavy cream powder and add almond milk after you add the mix. Start with 1 tbsp of the mix and taste. To make this dairy free just leave out the heavy cream powder and add a splash of coconut milk after you add the mix. Start with 1 tbsp of the mix and taste. Or use coconut milk powder. 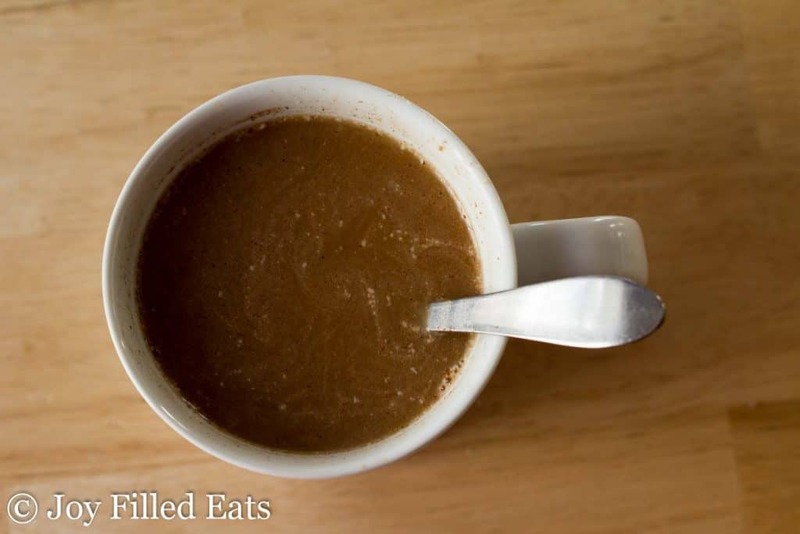 Make a delicious creamy chai in no time with my chai tea mix recipe! Pour 12 oz boiling water over 2 tea bags. Let steep until the desired strength is obtained. 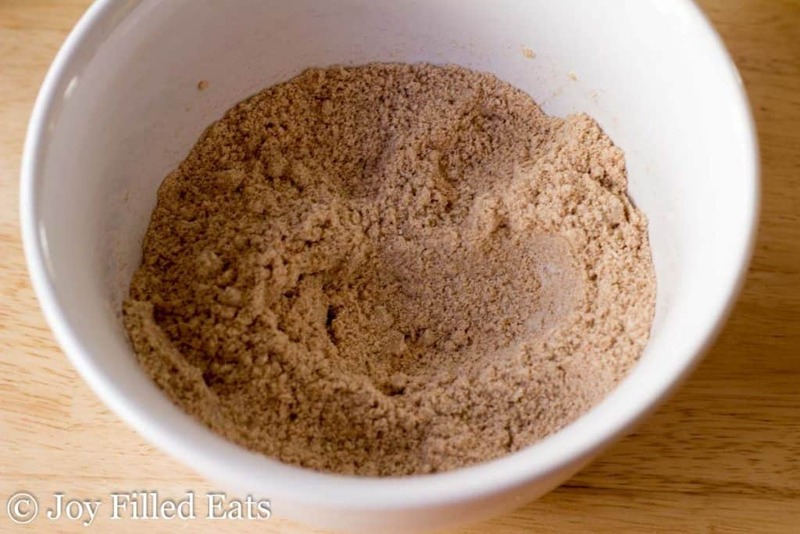 Stir in 3-4 tbsp instant chai tea mix. Add a few drops of vanilla if desired. Sip and smile. *** Some of these are pricey and I don't use them very often. My recommendation is to buy whole spices and then grind them as needed. They can last years that way. These measurements will make 4-5 cups of chai tea. You can make this in larger quantities if desired. As soon as I saw the chai tea recipe posted, I had an idea to try this mix in a sugar free vanilla ice cream. 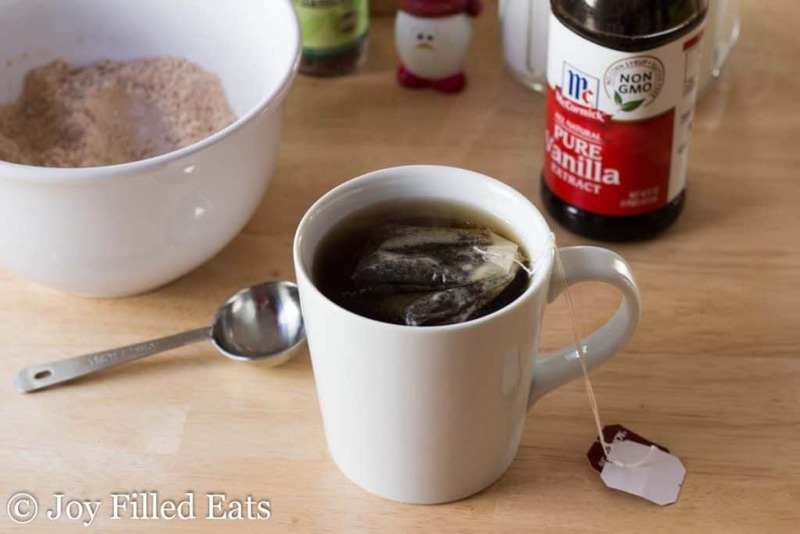 What instant tea mix & how much would you have put in this recipe if you did that instead of brewing the tea each time? My college age son has requested a chai tea ice cream since that is his new hot beverage addiction. :) not sure if it would work, to dump this whole spice recipe in a quart and half recipe of vanilla ice cream. Would love your thoughts? 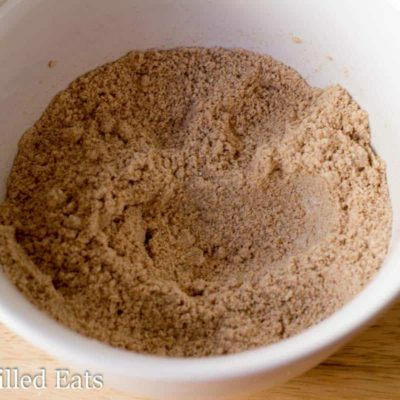 I'd try using a tablespoon of one like this and then taste testing: https://amzn.to/2usioXV The ones in the grocery store tend to have fillers like maltodextrin. Thank you so much! Our family enjoys so many of your recipes! Mixed up a batch tonight! So glad to have an option for keto diet! Could one use MCT oil powder instead of the heavy cream powder? You could add it to the hot beverage but that wouldn't work to make the mix. Do you use black tea? Yes, I've made it with regular black tea and oolong. Wow, Wow, and more WOW! I can't believe how good this stuff is. (Squealing like a little girl!) First, I had to wait for the heavy cream powder to be delivered. Then, I made a special trip to Penzeys to get the spices I needed. (FYI: I'm a serious spice-a-holic). I have been on a quest to find a replacement for the instant hot chocolate recipe I always made for the winter months. I don't drink coffee and not a fan of hot tea. I can honestly say that I found it. I just got my spices this past Saturday and have had 4 cups of this steaming deliciousness since then (and it's only Monday). I can't thank you enough Taryn. You're my new hero. Oh, and by the way, I NEVER post comments to recipes, so this is a first for me. I didn't care for this too much as a hot tea. However, I added it to a scoop of vanilla whey protein powder and 16 oz. of original unsweetened almond milk, and it was absolutely delicious!!! I will be using this combo as a post workout drink and/or meal replacement. Thanks for this - I had never heard of the heavy cream powder - the one you recommend is currently sold out so I will be looking for alternatives. Wilderness Family Naturals makes a great Coconut milk powder that dissolves well and tastes great. There is a touch of maltodextrin in it so THM purists might want to avoid, but those wanting the convenience of a dairy free instant might want to check it out. Will this recipe make a pint or half-pint jar? A little more than a half-pint. I was able to make one to drink and then fill a half-pint jar. This is awesome! I never even knew there was such a thing as heavy cream powder! I love having mixes ready ahead of time! This is perfect! Enjoying a cup right now and watching my newest Netflix obsession. Nice way to chase away the snowy day. Thank you! Can you tell me where you purchased heavy cream powder? From Amazon. The photo of the product is a clickable link to the one I purchased.